Given the many forms of internet marketing, sending email blast still remains to be on top of the game. With more than 2.6 billion email users worldwide and 205 billion email messages sent per day, it is not surprising that most businesses do email marketing as a way to promote their products and services. Often referred to as mass emails, email blast is sending a single electronic message to as many people as possible at the same time. By using a personally curated or bought email list, an email message is send out to hundreds or thousands of people simultaneously. With the power to increase web traffic, convert sales, promote website and expand online visibility, sending email blasts is without a doubt one of the most proven effective ways to boost a business. But email blast is not a magic formula, it should be done correctly and accurately to yield positive results. Here’s some fool-proof ways on how to create a successful mass email. Remember that when it comes to email lists, quality is more important than quantity. Instead of sending emails to thousands of random recipients, target those who are interested with your products or services. This way, you are not wasting time, money and effort pitching out sales to the wrong people. Before you start crafting or even sending emails, focus on building a good quality email list first. Email blast is not a magic formula that will instantly increase your sales. 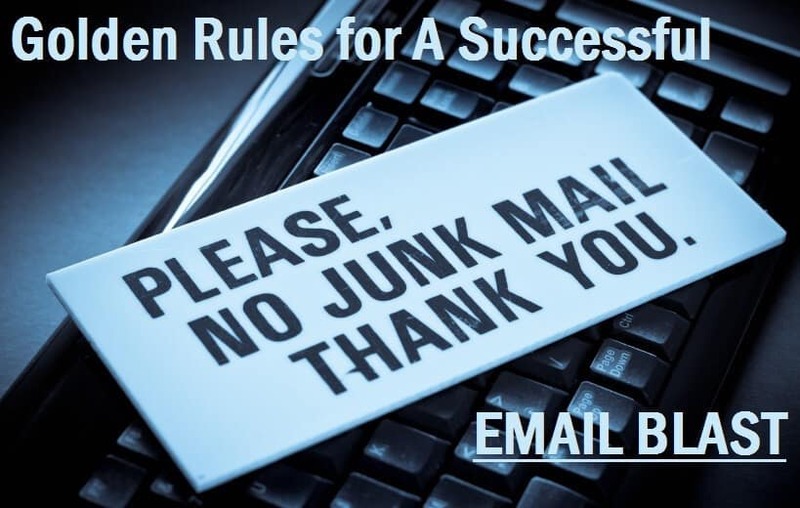 Don’t expect immediate results from sending just one email. This technique requires commitment, dedication and consistency to achieve results. It is recommended that for you to be able to test the effectiveness of your email campaign, it needs to run for a reasonable amount of time – 6 months to 1 year is required. An email blast with pure text is completely boring, but those with too many images are often labeled as spam. Whether you will be sending business or consumer emails, make sure that they have a good image-to-text ratio. Almost 67% of email subscribers turn off images by default so sending an image-only message is useless. Following the 50% text and 50% image ratio is perfect to create a sensible balance. With email blast, one can insert direct links on the email to point users to their websites. This in return increases web traffic and online visibility. When using call-to-action and contact information textbox, make sure that they are noticeable right away. Place them high up in the email and “above the fold” for it to be easily seen by the reader. Don’t make them dig out on what to do and where to reach you. Even if you buy email lists, there’s no guarantee that your messages will not be labeled as spam. To enhance inbox deliverability and to avoid spam filters, always plan and carefully execute your email’s content. Avoid using too much exclamation mark per sentence and don’t over capitalize texts. Use reputable services to host your images and try to maintain your email blast at 30-50 kb file size. Never use underground tricks to make your email blast successful, it might give you immediate results at first but it will hurt your business in the long run. Remember to steer clear from using random characters to confuse spam filters and don’t use deceptive subject lines like “Fwd:” or “Re:”. You should also avoid risky words that might trigger spam filters – don’t use words such as free, promo, buy, prize, bonus etc. Test emails are mandatory to ensure high quality messages all the time, especially if you’re into sending corporate or business emails. Before sending email blast, make sure to test it out first by sending it your email. This way you can check for formatting issues, content lapses, picture sizes, grammatical errors, mobile version problems and other easily-avoidable mistakes that can lure customers away. Coupled with the best email marketing software, email blasting can turn ordinary companies into extraordinary businesses. Using email blast as an internet marketing technique requires little time and effort but the effects are stunningly remarkable. Why Choose Third Party Mass Email Services? 8 Successful Email Campaigns Worth Stealing!